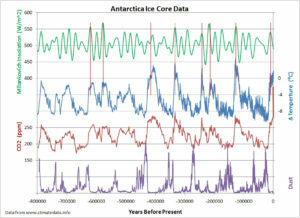 All climate data shows a cycle of brief clear-skied warm-ages followed by 100,000-year ice-ages full of volcanic-dust. Note the clear inverse relationship between volcanic dust and climate. The more volcanic ash/dust, the colder the Earth gets. Also note how fast temperatures fell after previous warm ages. Here is an theory for why climate cycles occur, and how the world as we know it will end when global warming runs its course and the next volcanic ice age begins. There can be no doubt that CO2 levels are rising, that the Earth is warming, and that these two things are correlated. But perhaps one of these things doesn’t drive the other. Perhaps both are driven by a third thing, namely seafloor spreading, or leakage from our planet’s molten center. 192 cubic kilometers of molten rock cools and accretes to the seafloor rift annually.How come this heat and gas leakage is entirely ignored by the CO2 people? If we look at any volcanic eruption, we will see how our planet contains lots of high pressure gas that blasts out and propels lots of hot material into the atmosphere. Aside from surface water contamination, this new volcanic air is 95%-96% CO2, exactly like the atmospheres of our sister planets Mars and Venus. 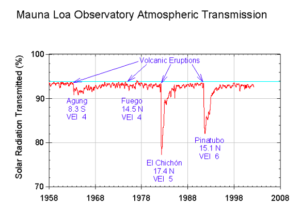 So clearly with volcanos at least, CO2 leakage is related to heat leakage. Imagine a freshly opened bottle of soda water. Imagine the bubbles of CO2 slowly coming out of the gassed liquid and rising to the surface. In a similar way, primordial CO2 gas constantly bubbles out of Earth’s molten center as froth to replenish the atmosphere and replace the CO2 constantly lost to buried seashells for example. The gassy or frothy nature of volcanic rock is obvious. 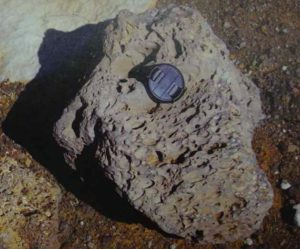 Also, this rock was once very hot and filled with new volcanic air that was 95.5% CO2. So in bubbly volcanic rock we see a source of both heat and CO2. Now consider Earth’s 80,000-km long seafloor rift system shown above. This is a sort of linear volcano that accretes about 6cm of hot magma each year as new sea floor. 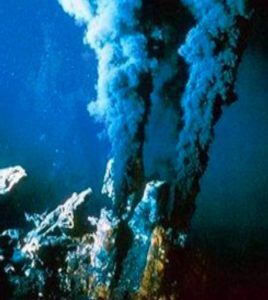 Because this accreted magma comes up as a froth, the seafloor rift leaks vast amounts of both heat and CO2-rich new volcanic air. Aside from gas buoyancy, can you think of another reason why super-hot magma would rise from deep within our planet and accrete to the seafloor rift? Clearly accretion at the seafloor rift is propelled by rising gas bubbles escaping from deep within our planet. And clearly this gas comes up as a froth, as is so typical of the magma we see ejected onto the surface of our planet. The high-pressure gassy rock froth tends to rise and build-up under the lithosphere, Earth’s hard shell. However, at the sea floor rift, these bubbles need to be much more highly pressurized than the water 2.5-kilometers down—about 249-atmospheres. If the volcanic gas is not more highly pressurized, it will not be able to overcome the back pressure of the oceans and escape. This super high-pressure volcanic froth is what builds up and then explodes from volcanos, frequently bringing up vast amounts of material. 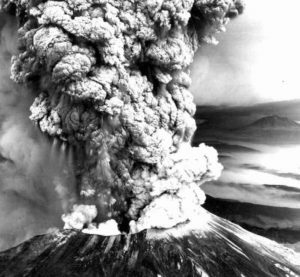 For example, the Toba eruption 74,000 years ago exploded up to 2,800 cubic kilometers of material into the Atmosphere. The Taupo eruption 26,500 years ago exploded 1,170 cubic kilometers of material. 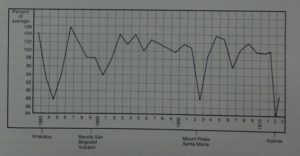 Also, these dates precisely match the dates of the volcanic ash peaks (and climate bottoms) in the first graph herein. The propellant for Volcanos is the same high pressure magma froth that rises at the seafloor rift. However, at the rift, the gas-part of the froth steadily bleeds off into the high-pressure water, while the magma-part rapidly cools and accretes to the seafloor rift thus driving seafloor spreading, earthquakes, volcanos and continental drift. With volcanos, the outgassing froth is prevented from escaping most of the time. Thus most of the time, it builds up pressure. Then periodically there is a leakage event—a volcanic eruption for reasons we will get to shortly. This leakage causes a rapid expansion of gas in excess of 250-fold. This rapid gas expansion tends to blow-apart and aerosolize most of the rock froth that contains the gas. The rapid expansion of gas over a widening radius (sub-lithosphere) also explains why most volcanos erupt over days and weeks instead of exploding instantaneously. It also explains explosive eruptions. 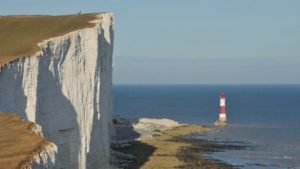 Consider of the chalk-white cliffs of Dover England, which are hundreds of feet tall. These cliffs are white from the calcium-carbonate in seashell that have been mostly pulverized, although many were fossilized and are still to be found. Marine creatures took calcium and carbon dioxide from the water and air and turned it into shells and bones. Then they died and their shells were buried ‘forever’. Later the seafloor was raised due to the well-accepted theory of continental uplift. There are massive and thick calcium- carbonate and calcium rich limestone deposits like Dover all over the planet. 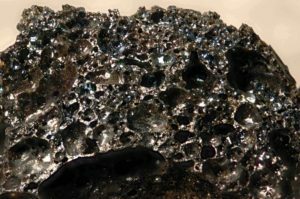 All that carbon had to have bubbled out of the planet as new volcanic air before it was accreted back to the surface of the planet by life forms. After all, where else could such immense amounts of carbon have come from? Most of the heat and CO2-rich new volcanic air escapes from within our planet via the 80,000-km long seafloor rift system. Yet there are few CO2 bubbles in the water because high- pressure water can contain lots of gas without bubbles. It is just like a sealed bottle of soda. Open a bottle, and lower the pressure, and CO2 bubble appear, due to the lower pressure. 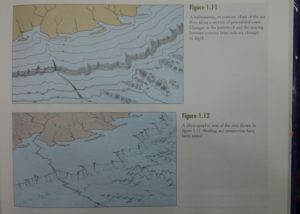 The seafloor rift/ridge runs about 2.5km below sea level. Here, immense pressure not only permits bubble-free soda-water, but it also permits water to remain un-boiled at extremely high temperatures, like in a pressure cooker. In some sub-surface vents, the liquid water has been measured over 410°C. This is almost 412°C, the temperature where steel-frame buildings first start to barely soften and weaken in structure fires. It is also close to 460°C, the temperature where some forms of magma become not entirely solid. So here, at the sea floor rift, Earth’s hard shell is hot, thin and barely solid. And here is where super high-pressure volcanic gas bubbles melt and force their way through the thinnest part of Earth’s skin. These gas bubbles normally come up as a froth of gas and super-hot magma from deep within our planet. Thus, when there is more magma froth leakage, there is also more heat and CO2 leakage. And when froth leakage slows, so does heat and CO2 leakage from the planet’s hot and molten center. So the reason why temperatures move in step with CO2 levels, is not that one thing causes the other, but that both result from the rising magma froth that drives seafloor spreading. When Earth’s surface is warming and melting ice, the oceans deepen. This causes the already hot, thin, and soft rock at the sea-floor-rift to grow a bit hotter and softer, just as if it was buried deeper underground—only it is buried with water, not rock. Then the softer rift permits more high-pressure magma froth to force its way out—releasing both heat and CO2 from Earth’s molten interior. This further warms the planet’s surface, melts more ice, deepens the oceans, and softens the seafloor rift still more, allowing still higher levels of CO2 and heat leakage. It also accelerates seafloor spreading and eventually earthquake activity. The increases in CO2 and heat leakage continue on feedback-style until Earth starts running out of ice to melt — especially non-polar and non-mountaintop ice. Then ocean deepening slows and eventually stops. Thus at this point, seafloor rift softening also slows and then stops. Then, with the surface above its average temperature, the system is more susceptible to reversal than continued warming. At some point, due to either random variability, or a volcano erupting (for reasons that will be soon explained), the process starts working the same way, feed-back style, but in reverse. Then a cooler Earth causes more ice to build. 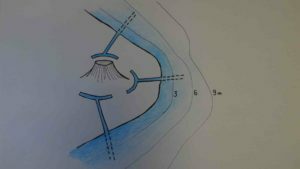 Then shallower oceans cause the seafloor rift to behave as if it was shallower underground, only it is buried with water, not rock. This makes the seafloor rift colder, thicker and more solid, permitting less outgassing, less heat leakage, and causing still more ice to build. Thus a progressively cooler surface causes less CO2-rich magma froth to escape. Thus the ice caps build, and the oceans grow shallower still. 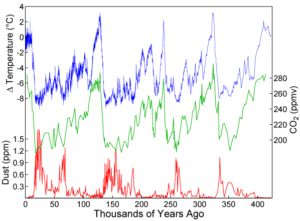 Google “100,000-year climate graph” to see many Versions of this graph. So yes, Earth does have a thermostat mechanism, but the temperature range between the on and off switches is some 15°C top-to-bottom— in the polar regions. And within this range, the same thermostat mechanism Actually causes wild temperature swings. Incidentally, this is the only reasonable explanation that anyone has ever proposed for why Earth experiences the wild temperature swings shown in the following graph above. The CO2 theory offers no reason at all for these short-term temperature swings. In fact, the CO2 theory offers no credible reason for what makes CO2 levels rise and fall on less than a 20,000-year time scale. 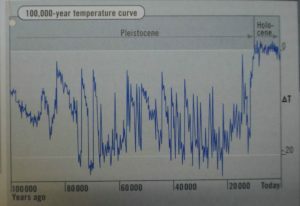 The lowest temperatures in the previous graphwereabout22,000-years ago. 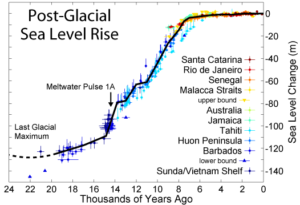 And we know from drilling coral reefs (graph below) that sea levels were about 142 meters lower 22,000 years ago, at a particularly cold ice age maximum, with exceptionally high levels of volcanic ash/dust (see first graph herein). So we not only have a consistent bottom temperature for Earth’s climate, but we can also infer a consistent bottom sea level around 135m lower, only briefly reaching 142m in the last particularly deep ice age. The 135-meter change in sea levels between ice•age bottoms and today’s warm•age sea levels is about a 5.4% change in ocean depth on average at the seafloor ridge/rift, which is ± 2,500m down. The rift here is hot, soft and thin. It is also poised near a tipping point where outgassing pressure is barely enough to overcome the sub-lithosphere effects of seawater back pressure. Thus a small change in ocean depth has an exaggerated effect on the rift’s strength, gas permeability and heat leakage. Thus we see that our planet’s thermostat is primarily a pressure mechanism as we would intuitively expect—a pressure mechanism regulated by ice cap size and ocean depth/ sea levels. Now again, when new volcanic air comes up, it tends to come up as a froth of super-high pressure gas and super-hot magma from deep within the planet. The high pressure gas accounts for how the froth rises, and how it forces its way out through the lithosphere. Now sea levels 135m down is a curious statistic. This is because it exactly matches to the average depth of the non-polar continental break, which is also about 135m down depending on how we measure it. 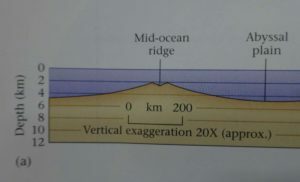 The continental break is where the barely sloping continental shelf abruptly becomes the continental edge, and a steep descent to the deep sea floor, as shown below. Note the abrupt edge at the continental break. The average width of the continental shelf is 60km and the fall is 135m, thus it has a remarkably shallow 0.225%-slope on average. Here is a greatly exaggerated profile of the Continental margin. Sea-erosion of the continents is something that mostly happens near the ocean’s surface, in the wave and tidal zone. Then, over the eons, and countless climate cycles, as sea levels cycled between ice-ages and warm-ages, wave and tidal action eroded the continental shelf. The remarkable abruptness of the continental break in non-polar regions around the world speaks of a climate bottom that as remained relatively constant for eons. 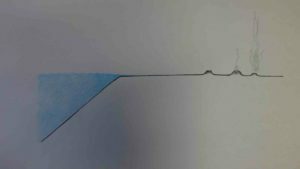 If the climate bottom temperature had varied by much, the continental break would have a rounded edge, not the remarkably abrupt edge we observe. Now the way Earth’s climate bottoms coincide with the continental break—this does make sense within the CO2 theory of climate. The problem—a fact that makes the CO2 theory look astronomically unlikely–is how planetary temperatures and CO2 levels consistently peak right when the planet starts running out of ice to melt. You see, in each of the 5 most recent climate tops (“interglacial periods”) we have believable ice-core data on, temperatures approached a couple degrees higher than today. And obviously, a couple degrees higher, and Earth will start to run out of ice to melt. After all, Earth is already starting to run out of ice to melt, isn’t it? Surely it can’t be a coincidence that Earth always starts running out of ice to melt when CO2 levels peak. But under the CO2 theory, it must be a mere coincidence. You see, according to the CO2 theory, CO2 levels determine temperatures, which then determine ice cap size — and not the other way around. 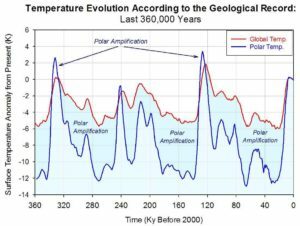 So under the CO2 theory, it must be a mere coincidence that Earth starts running out of ice to melt right when temperatures peak— a coincidence repeated in all 5 of the 5 most recent ice ages, all the ice ages we have believable data on. But surely this can’t be a coincidence. Surely the running out of ice to melt must cause temperatures to peak. And sea levels must in some way drive CO2 levels rather than the other way around. Here we see how seafloor spreading occurs, one basalt column at at time. The textbook drawing is incidentally quite deceptive. The columns actually run from the bottom of the lithosphere to the planet’s surface at the sea floor, and are dozens of miles tall. The basalt is propelled upward and through the lithosphere by gas in the magma froth. The gas bleeds off, and the ±5,000°C magma cools and then hardens as fast as a tongue touched to frozen metal, only on a geological time scale. It must be noted that a porous cold seam exists between the columns. Thus seawater can penetrate both horizontally and to great depths through this porous material. Thus each column rapidly gives off its heat to the oceans. 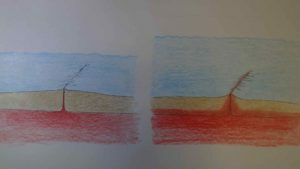 So it does not take eons for the new sea floor to cool by thousands of degrees to dozens of miles beneath the surface. Instead it is only perhaps a matter of centuries. 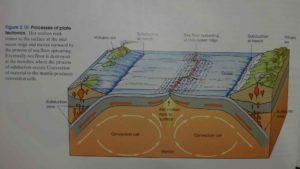 It should also be pointed out that most subducting seafloor is this type of material, so just as this material cools quickly due to all the cold seams, it also melts quickly for the same reason. The seafloor not made out of this type of material is much slower melting and it thus has trouble subducting and tends to agglomerate to continents. 1. The porous columnar basalt may also be permitting large amounts of sub-lithosphere heat to escape in addition to the cooling new lithosphere. 2. It is not only increases in seafloor spreading, but also falls in volcanic ash/ dust levels that cause the planet to warm (see red graph line, 5th image up). 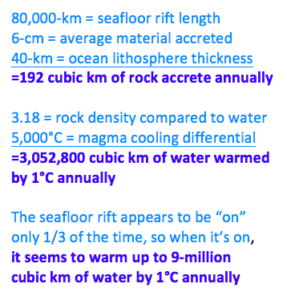 Sea floor spreading is surely not responsible for all of the temperature swings. 3. Antarctic temperatures falls are exaggerated in ice ages due to diagonal filtering of sunlight through volcanic ash —very high ash levels judging from the same red graph line. 4. Less outgassing and lower CO2 levels also imply a thinner atmosphere. Antarctica is a high altitude continent, and these two factors are multiplicative. Thus Antarctic temperature swings are exaggerated in a second way. 5. This volcanic theory of climate easily quantifies and models, while the CO2 theory cannot be modeled, even after decades of attempts. 6. The graph above probably understates the polar amplification. Note how Earth warms rapidly but cools slowly. This is because the poles are deserts with very little rain. As well, during volcanic ice ages, there is less heat, less evaporation, and less rainfall. Thus the ice caps build slower than they melt. Thus sea levels fall slower than they rise. In fact, Earth spends less than 1/3 of its time warming. Thus the long-term average seafloor spreading rate can easily be tripled when the seafloor rift turns on. Note how most volcanos are located near the ocean or some other warm-age water source. Also, by nature, most volcanos are surrounded by heat fractured rock. Volcanos and Ice agesNow while climate tops occur when the planet begins to run out of ice to melt and oceans stop growing deeper, there is a different volcanic-ash and sunlight-shading mechanism at work causing climate bottoms. It is important to realize that Earth has two different thermostat mechanisms, and both are based on different aspects volcanic activity. After global warming runs its course and Earth starts running out of ice to melt, the oceans will grow shallower. 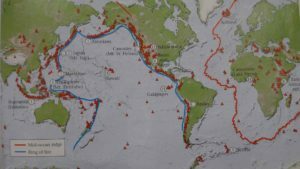 But more importantly, due to the almost-flat a 2-in-1,000 slope of the average continental shelf, thealmost infinite waters of the oceans will grow 1- km more distant from the world’s many coastal volcanos for each 2-meters that sea levels fall. And because this is insufficient slope for water to flow through the heat fissured rock around volcanos, it results in many volcanos periodically drying out during ice ages. 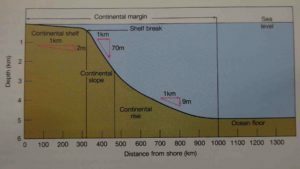 Again, the average width of the continental shelf is 60km and the average fall is 135m, thus the shelf has only a 0.225% slope on average. This is about 1/10th of the slope people normally engineer into their walkways so they drain surface rain water. Sea levels are important for volcanic eruptions in two ways. Firstly, and obviously, the almost infinite waters of the oceans act as a coolant that retards a great many volcanos by some small increment. But secondly and less obviously, water is the difference between a world of volcanos filled with gas-porous dry ash and a world of volcanos filled with much less gas-porous ash mud. Thus as sea levels rise, the world’s volcanos become self-clogging and build up gas pressures. And then when sea levels fall, the water goes away, the volcanos dry out and then many volcanoes release their pent-up magma froth. The actual climate bottoming mechanism is that when sea levels fall to the average continental break, the oceans stop retreating horizontally from the world’s volcanos. Instead, they only fall diagonally, and this does not have nearly as great a drying effect on the world’s volcanos. Here is why climate bottoms coincide with the continental break. Now humanity should be able to mostly counteract the retreat of the oceans for thousands of years by proactively digging seawater channels to the world’s at-risk volcanos—by using its immense blue-phase populations for this purpose. And many of these volcano irrigation projects will each by themselves be tasks greater than any excavation project mankind has attempted before. And there will be hundreds of volcanos to irrigate. But given enough decades and centuries, we should be able to delay the next ice. During this time, we will become expert at using explosives to gently dislodge ash plugs. Thus we will “open our soda bottles slowly” and bleed down gas pressures in the world’s volcanos—while they are still wet and self-clogging. If we don’t do this, if we don’t counteract the retreat of the seas, Gaia will bring a much quicker end the current 20,000-year period where Earth’s volcanos have seen increased amounts of water due to global warming and melting ice. Instead, the increases will eventually taper-off and then reverse. Then, at some point, a giant volcano will erupt. Then another and another and another. 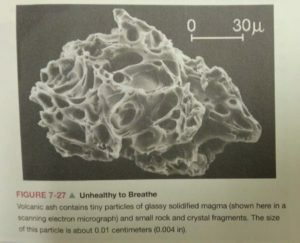 Then the dry stratosphere will fill with microscopic ash particles (microscopic air-filled rock foam analogous to floating bubble-bath foam) and the Earth will be enveloped by a great sunlight reflecting haze. 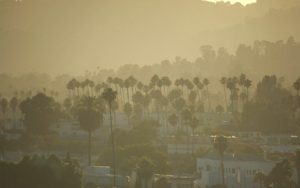 The ancients called this haze the ‘end of days’, the end of bright sunny days. Then without bright sunny days, more of the Earth’s surface will freeze, sea levels will fall further, and more importantly coastlines will retreat from more of the planet’s volcanos. Then seawater will stop delaying still more volcanos in feedback style. Thus Earth’s 20,000-year warm, wet, beautiful blue phase, the world as we know it will end. And then, as surely as winter after summer, the planet will go into another cold, dry, filthy, volcanic-ash-driven ice-age of around 110,000 years. And to be clear, all climate data sources describe this ice-age cycle without exception. Thus the real problem that humanity faces is not global warming without end, but the cold, dry, filthy volcanic-ash-driven ice age that ALWAYS happens when global warming runs its course. Here we might pause to consider how the Toba volcano 72,000 years ago blasted 2,800 cubic kilometers of material into the atmosphere. (Toba coincides with the 2nd most recent dust peak on the 2nd graph above.) This is about 560 times as much material as the Pinatubo volcano shown above. The Pinatubo volcano only put 5 cubic kilometers of material in the sky yet caused a worldwide reduction in sunlight by over 7% for over 15 months. And when we include the peaks and shoulders, the number is about 50% higher. Now the total annual energy consumption of mankind is said to equal 1.5- hours of sunlight striking the planet. If this is true, then the loss of solar energy from Pinatubo including peak and shoulder was about 765 times mankind’s current annual energy budget! In the “pyroheliometric” graph above, we note that Pinatubo-scale eruptions, and larger, happen quite often, even in a warm age. Thus volcanos repeatedly drive planetary temperatures down by over 10%—and these temperature falls are quite obvious to people using mere thermometers. If the next ice age really is coming, we are fools not to store-up many years (or decades) of food supplies while the sun actually shines. Besides, today’s 3-month worldwide food buffer is still inadequate for another Tambora-sized eruption, even if no ice age is coming. Grain is just so incredibly cheap. A 1-year supply is only $140 per person. That’s ±$1-trillion for the world, or about 1.2% of world GDP. And we can still give the grain to the poor before it expires, or feed livestock with it, or make alcohol with it. So then net annual cost of say an 8-year food buffer is only on net, maybe 0.5% of world GDP annually. If the grain is kept near freezing and in dry oxygen-free containers, it will supposedly remain edible for some 40-years. Thus we are capable of preparing for a 40-year total loss of agricultural output. Thus, we are able to let everyone die of old age while we reduce our new generations to whatever size we must reduce them to. So for those of you with an ear for the the Devil’s music: Thanos was not right. Or rather, this horrible idea is completely unnecessary if we just take some precautions that are in fact, 10-to-100 times easier than reducing our CO2 output. If we don’t substantially increase our food buffer, then humanity WILL eventually experience a giant murderous famine of all famines at the dawn of the next ice age: A famine where machine-enabled men comb the planet’s ecosystems looking for food, eating-up many of the planet’s species at their moment of weakness. We humans have become just too powerful to suffer a global famine without causing a mass extinction event. It will be a famine where most of humanity still dies in a quest for food and survival. It will be a famine without hiding places because hunger will cause people to betray all secrets and ties in an age of shortwave radio. A famine where machine-enabled men full of hunger, rage, and blame make it their main thing in life to find every bunker and cave. They will say “Open up, or we will bust your bunker, and you will die”. Thus preparation, global cooperation, and a much more trustworthy and universal form of democracy seem the only sensible path forward through the end of days. the current state of corrupt democracy will result in nothing but a global catastrophe for everyone on Earth. People are so eager to insure their cars, homes, health, national defense and even travel arrangements. What about our all-important need to eat? Isn’t food insurance more fundamental? The path we are blindly following today leads to nothing but suffering for everyone, and death for most of the world. Now because I fear the selfishness and stupidity of some people, I must point something out. It is that 7-billion people will dig irrigation works for Earth’s volcanos 10 times faster than 700-million. 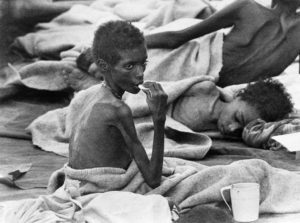 However, with regard to a worldwide ice age famine, it makes little difference whether we are 7-billion or 700-million. We will still have a horrible murderous famine and eco-system catastrophe at the dawn of the next ice age if we only have 3-months food supply. 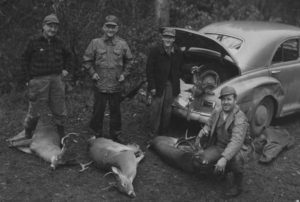 Thus the primary problem is not to reduce populations, but to have lots of food stored as a buffer. What happens after global warming? All climate data shows that there will eventually be another 110,000 year ice age, and skies full of volcanic ash haze. This may come in 5-days, or 5,000-years, but it will eventually come—as surely as winter after summer. The ice core data clearly shows an ice-age world of frequent large eruptions and much less solar energy to evaporate water for rain. The data also shows a world of immense and rapid climate swings that will surely challenge agriculture. What could be more important than the end of days, the end of bright sunny blue-skied days? What could be more important than the end of the world as we know it? And why don’t people talk about the obviously high levels of volcanic dust in the ice core records? All it takes is one large eruption, a bit bigger than say Tambora in 1816, the volcano that caused the year without a summer. Then our jet aircraft, solar power, wind energy, and most importantly our agriculture may not really work well. Then, nobody will care about greenhouse gasses, or manmade air pollution, or pesticide toxicity, or food preservatives. In fact, people will want the strongest preservatives and pesticides possible.